This new on most cars. Also, I don't like that it's one socket per certain row. Hell, I'm might as well get a three socket splitter! These were taken on BNSF Line while I was visiting my sister in Aurora last week. This is new on most cars (intercom). Also, I don't like that it's one socket per certain row. Hell, I'm might as well get a three socket splitter! These were taken on BNSF Line after I was visiting my sister in Aurora last week. The first on CTA was an indication that they were cutting conductors. Maybe it was part of the rehab, or maybe a sign of something else. Did you catch the car series (i.e. old Burlington 700 or 800, WSMTD 7100, or a 10 year old Nippon Sharyo car)? 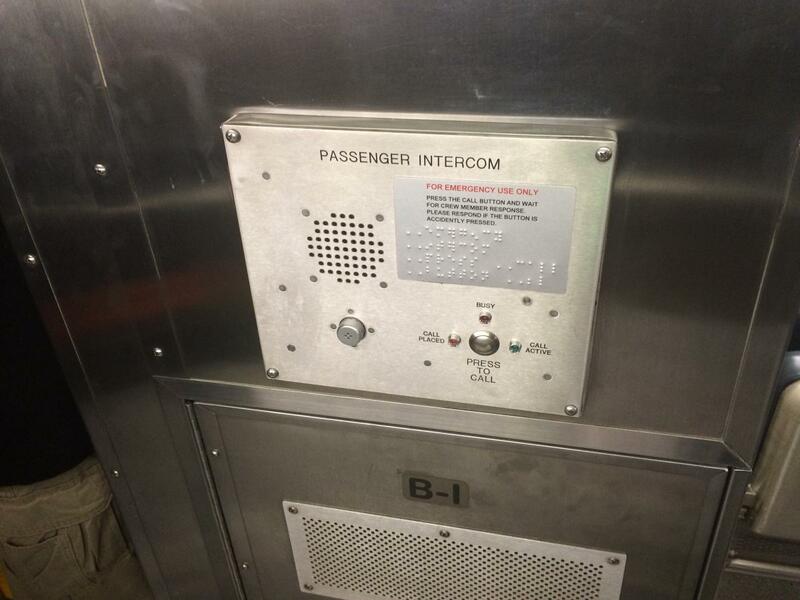 The intercom was on Nippon Sharyo Cab Car #8469. Maybe trainman can tell us the significance. Also, if it was an 84 rather than an 85 or 86, it is the kind of cab car that usually is on the UP, and about 10 years older than the latter. BNSF owns #8449, #8469, #8473-78. Milwaukee District has #8409, #8446, #8466, and #8468. UP lost some of theirs in the lower 8400s to Rock Island. 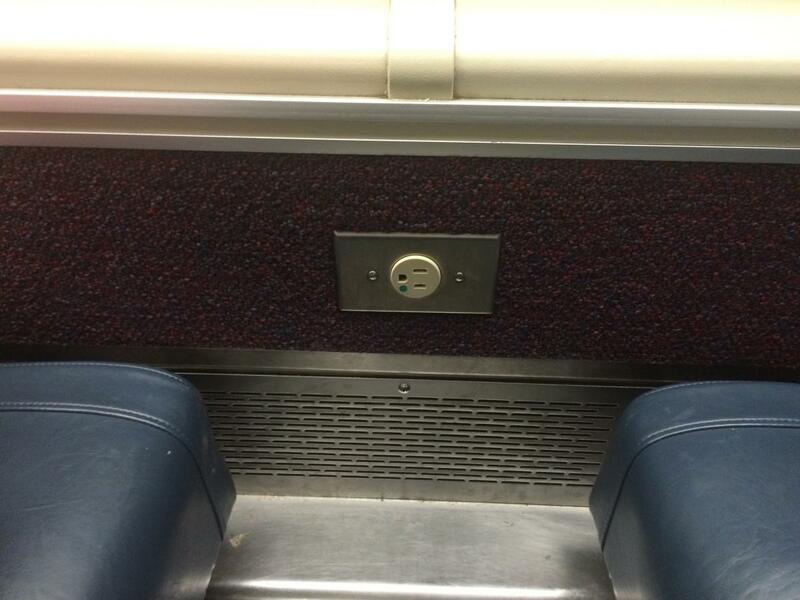 Metra announced a rehab program of its Amerail cars a while back, and some of the things that were on the agenda were adding power sockets and intercoms. They also added displays that would read out the announcements, similar to the existing Nippon Sharyo cars. They have a gallery of the work here. I ride in the second to front car inbound on the UP Northwest Line. It's almost always a Nippon Sharyo car, and when it is, it never has power outlets. The car in front is almost always a Amerail car. If you look at the builders' plaques, both are NP cars, just that the 1990s ones were assembled by Amerail and the 2000s ones by SuperSteel. The plaques on 7400s/8400s say both NP and Amerail. If you look at the builders' plaques, both are NP cars, just that the 1990s ones were assembled by Amerail and the 2000s ones by SuperSteel. The plaques say both NP and Amerail. Oh. And the Nippon Sharyo website agrees with you, since they have an page for both railcars on their product page. Maybe I'll start referring to them by their series number, or their window size. There are very few 8500s assigned to the UP. I believe they are there only to cover the 8400s sent for rehab. You most likely will always see a 6000 behind the 8400s in the consist. That is because the cab car is the designated ADA car and others ADA cars are used to store bikes (silly) and they have to keep at least 4 cars together for that. The last time I've spotted 8500s on UP were #8507, #8510, #8515, #8520, and #8525. Also, I don't understand why Milwaukee District has BNSF's #8580 for some odd reason. I know that the Burlington had rules that required that their coaches had to have higher strength anti-telescoping protection than the other commuter roads had. Is it still in effect now that it's the BNSF? Can't be, since they at least originally got the same 8500s as did the Metra operated lines. There is the question raised by Bill V. whether those on the BNSF have different electrical (hard to believe they still do considering they got 400 series locomotives and 8500s, and the equipment has been interchanged with others, such as when 401 was on a tribute tour on the Milw N). Yeah, I was on one of them, so I sat up front that time. Makes sense about covering for the 8400s. Metra has publicly said they have a low amount of railcar spares or something like that (On The Bilevel). No it isn't. Displayed H ticket indicates a long distance trip, several people said "please" and "I'm sorry," Mickey Rooney didn't actually have a knife, and the conductor eventually appeared. Throw the guy with the potty mouth on the Red Line on the South Side and see what happens to him. Unless you do what Jack said and send them down on the Red Line South. Time for a private investigation!!! I'm guessing this had to happen at Union Station based on the view through the windows. Hell, I rather see people fight Metra about the f'ing fare increase starting tomorrow and a possible of non-stop increases for ten consecutive years!!! Metra's refusal to increase fares for years forced them into a massive increase last time & another one now. Due to inflation & the high price of oil, Metra screwed itself. They should have done small increases on a regular basis. The post office does this every year, by a penny or two. People grumble, use the mail less & less due to technology, but they do accept the increases. Had they done a nickel or dime per zone every year, they would have gotten their passengers used to that & would also have avoided that huge increase last time. Now what I'd really like to see, if Congress can ever realize that investing in public transportation is great for the country, is the electrification of all the lines, except for the Heritage & maybe the Southwest Lines, which just don't have the number of runs to justify it. That would also eliminate the huge diesel pollution problem downtown. When I ride the UP North outbound, I can smell the exhaust being sucked into the cars, especially when there's a north wind. The post office has forfeited increases, and this year said they were not raising the 49 cent first class rate. Besides that, the post office hasn't figured out how to get out of deficits, especially since most transactions are now electronic. You didn't snail mail this message. Hence, it is certainly not the model to emulate. Metra had a couple of fare increases over the last couple of years. You really think Congress is going to pay to electrify a whole bunch of freight railroad rights of way? Like all the foamers claiming that that Metra should convert to DMUs, where is it going to get the money to buy about 800 cars, now at $4.5 million each, especially, when even with its bond plan and fare increase, it projects only being able to replace about 1/4 of the cars it needs too? Also, the UP has the newest trailer cars. Don't forget, the Republicans are in charge of Congress and the Highway Trust Fund isn't in good shape. Maybe the more efficient answer is for Metra to get a better fan. Looks like Metra changed the downtown arrival announcement. It used to say "Please remember to take your tickets and personal belongings. Please watch your step when exiting the train. Thank you for riding Metra today." Now it rearranged the sentences so that "Thank you for riding Metra today." is first. They also added a sentence that reminds passengers to avoid the surcharge one gets if they buy a ticket onboard when there's an open ticket booth. ... They also added a sentence that reminds passengers to avoid the surcharge one gets if they buy a ticket onboard when there's an open ticket booth.